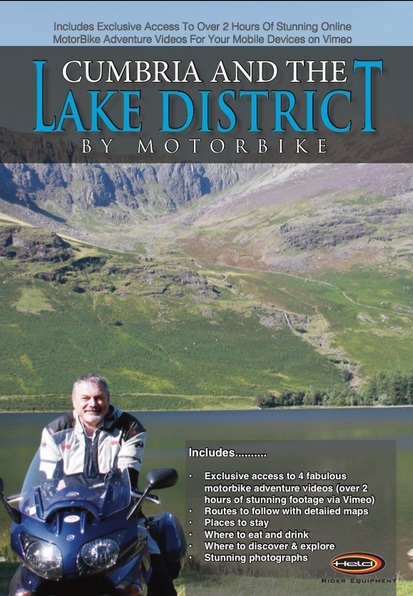 Full colour pages packed with stories of routes to follow, great photographs, featuring motorbike friendly places, plus information on how to link to 'Exclusive Vimeo Videos' with 4 tours providing over 2 hours of fabulous video footage of where to discover & explore. Also includes information on links to fully featured google maps for you to study the routes and the maps also feature the motorbike friendly places. Kevin J. Lear loves the wind on his face, the sense of speed, the thrill of the open road and the sheer delight in his surroundings which a motorbike brings. The Lake District has everything for "you to get the most from your machine and to make you smile until your cheeks hurt". He likes the twisting roads and the views that take your breath away. Adventure Number Two round Newlands Valley and Borrowdale will have "your jaw dropping with vistas and opportunities". He crosses over a small humped back bridge in the Newlands Valley and "starts riding towards Paradise". On this single track road, he warns there is the chance of meeting oncoming vehicles, tractors or "the occasional flock of sheep being ushered along by a shepherd on a quad bike with his dog running around as if it was nuts". You come across "interesting steep turns to test your skills but, most of all, panoramas like this simply make your eyes water with pure joy". He sees "the stunning purple sprouting heather coating the fellsides and tops of the surrounding mountains, as if a lashing of blackcurrant sauce was flowing down the sides of a massive bowl of mint choc chip ice cream". He confesses his surroundings were so beautiful that it was difficult to keep his eyes on the road. In fact Kevin found everything so beautiful that he was overcome by tears. The descent into the "magical Buttermere and Crummock Water area" leaves him breathless. But he does give some sound advice: "Now, place your bike into 1st gear and let the slope going down take you." The bike has its advantages. Rocks have been placed alongside the road by Buttermere to stop motorists parking, but the skilful biker can weave around the rocks, "set up a bike, set up a tripod, focus the camera, set up the tripod, set up the timer, press the button, run back to sit on the bike, look at the camera and smile". Kevin has time for a history of Honister slate quarries and then he is back on his bike, heading down to Borrowdale into a view "slapping you around the face with a welcome of 'You mean you didn't come here first' ". Having got to Watendlath - "to what I consider one of Britain's finest and most spectacular vistas" - Kevin parks his bike and "takes off helmet, gloves and maybe jacket", before he dons them again and heads for Keswick, "getting glimpses of Derwentwater" through the trees on his left. Another adventure begins at The Rooster Cafe near Penrith and takes in views of Blencathra before heading along the nine miles at the side of Ullswater, through Ambleside and the Langdales, and over the Wrynose and Hardknott Passes. We are warned: "The climb starts with the whispered suggestion 'only ye who are brave enough should pass' as the gradient becomes 1 in 3, . . . with adverse camber bends testing your very strength and throttle control." Eventually, the unscathed biker arrives at Ravenglass. There are two other routes. One runs from Alston to Haweswater over Hartside. The other is a circuit around the Upper Eden Valley through Appleby and Ravenstonedale. Kevin is a latter-day Wordsworth rejoicing in scenes recollected in tranquillity. His enthusiasm would make anyone stride a saddle and set off into the sunset. And if you haven't got a motorbike, each of the adventures has been captured by a machine-mounted video camera. Perfect, if you want to have all the pleasure without having to test your skill and throttle control on those adverse cambers and those 3-in-1s.